Shirley Knight Hopkins (born July 5, 1936) is an American actress who has appeared in more than 50 feature films, made-for-television movies, television series, and Broadway and Off-Broadway productions in her career playing leading and character roles. She is a member of the Actors Studio. Knight has been nominated twice for the Academy Award for Best Supporting Actress, for The Dark at the Top of the Stairs (1960) and Sweet Bird of Youth (1962). In the 1960s, she had leading roles in a number of Hollywood movies such as The Couch (1962), House of Women (1962), The Group (1966), The Counterfeit Killer (1968), and The Rain People (1969). She also received Volpi Cup for Best Actress for her role in the British film Dutchman (1966). In 1976 Knight won a Tony Award for her performance in Kennedy's Children. In later years, she played supporting roles in many films, include Endless Love (1981), As Good as It Gets (1997), Divine Secrets of the Ya-Ya Sisterhood (2002), and Grandma's Boy (2006). For her performances on television, Knight eight times was nominated for Primetime Emmy Award (winning three), and has also received a Golden Globe Award. Knight was born in Goessel in Marion County, east central Kansas, the daughter of Virginia (née Webster) and Noel Johnson Knight, an oil company executive. At the age of 14, she wrote a short story which was published in a national magazine. Knight later attended Phillips University and Wichita State University and trained in acting with Erwin Piscator, Lee Strasberg, and Uta Hagen at HB Studio. Knight's feature films include The Group (1966), The Dutchman (1966), Petulia (1968), The Rain People (1969), Juggernaut (1974), As Good as It Gets (1997), and Elevator (2011), in which she plays one of several people trapped in a Wall Street elevator with a bomber. Knight was cast in 1958 and 1959 as Mrs. Newcomb in twenty of the thirty-nine episodes of the NBC western television series, Buckskin, with Tom Nolan, Sally Brophy, and Mike Road. She became a Warner Brothers Television contract star who while on breaks filming movies appeared in such WB television series as Maverick, Bourbon Street Beat, Sugarfoot, Cheyenne, and The Roaring 20s. A life member of The Actors Studio, Knight's stage credits include Three Sisters (1964), We Have Always Lived in the Castle (1966), Kennedy's Children (1975), which earned her the Tony Award for Best Performance by a Featured Actress in a Play, and A Lovely Sunday for Creve Coeur (1979). She was nominated for the Drama Desk Award for Outstanding Actress in a Play twice, for Landscape of the Body and The Young Man from Atlanta, for which she received another Tony nomination. 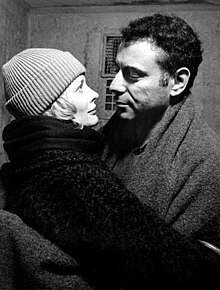 She also appeared, with Alison Fraser, in Come Back, Come Back, Wherever You Are, (2009) an original play by playwright Arthur Laurents. Her television credits include Target: The Corruptors!, The Eleventh Hour, The Outer Limits ("The Man Who Was Never Born"), The Reporter, The Fugitive, The Invaders, The Virginian, Murder, She Wrote, Thirtysomething, Law & Order, L.A. Law, Law & Order: Special Victims Unit, Maggie Winters, ER, House M.D., Crossing Jordan, Cold Case, and Hot in Cleveland, among others. She has appeared in various television movies, including Playing For Time and Indictment: The McMartin Trial. For the latter, she won both the Emmy Award for Outstanding Supporting Actress in a Miniseries or a Movie and the Golden Globe Award for Best Performance by an Actress in a Supporting Role in a Series, Mini-Series or Motion Picture Made for Television. Her guest performance in thirtysomething earned her a 1988 Emmy for Best Guest Performer in a Drama Series. She won Emmy in 1995 for her guest performance in the NYPD Blue episode "Large Mouth Bass". She appeared in the first segment of If These Walls Could Talk. She also had a recurring role on Desperate Housewives. Knight was married twice, to actor and producer Gene Persson, from 1959 until they divorced in 1969, and to writer John Hopkins, from 1969 until his death in 1998. She has two daughters, actress Kaitlin Hopkins and elementary school teacher Sophie Hopkins. 1960 77 Sunset Strip Mari Ellen Taylor Episode: "Fraternity of Fear"
1961 The Roaring 20s Ellie Hollis Episode: "Big Town Blues"
1962 Naked City Kathy Meigs Episode: "Five Cranks for Winter... Ten Cranks for Spring"
1963 The Outer Limits Noel Anderson Episode: "The Man Who Was Never Born"
1964 The Fugitive Janice Pruitt Episode: "The Homecoming"
1966 The Fugitive Jane Washburn Episode: "Echo of a Nightmare"
1967 The Invaders Margaret Cook Episode "The Watchers"
1973 The Streets of San Francisco Mary Rae Dortmunter Episode: "A Room With a View"
1973 Circle of Fear Beth Episode: "Legion of Demons"
1974 Nakia Faye Arnold Episode: "Pete"
1982 Nurse Sylvia Dennis Episode: "Euthanasia"
1982 Tales of the Unexpected (TV series) Elizabeth Bourdon Episode: "A Woman's Help"
1984 Hammer House of Mystery and Suspense Ann Fairfax Denver Episode: "The Sweet Scent of Death"
1989 Murder, She Wrote Grace Fenton Episode: "Smooth Operators"
1989 The Equalizer Kay Episode: "Time Present, Time Past"
1990 Matlock Phyllis Todd Episode: "The Mother"
1990 Murder, She Wrote Grace Lambert Episode: "Always a Thief"
1991 Law & Order Melanie Cullen Episode: "The Wages of Love"
1993 L.A. Law Belinda Collins Episode: "Hello and Goodbye"
1995 Fudge Mrs. A Episode: "Fudge-a-mania"
1995 NYPD Blue Agnes Cantwell Episode: "Large Mouth Bass"
1996 Cybill Loretta Episode: "Romancing the Crone"
2001 Law and Order: Special Victims Unit Dr. Wharton Episode: "Repression"
2002 Ally McBeal Helen Apple Episode: "Homecoming"
2002 ER Mrs. Burke Episode: "Insurrection"
2003 Law & Order: Special Victims Unit Rose Granville Episode: '"Tragedy"
2004 Crossing Jordan Frances Littleton Episode: "Most Likely"
2005 House Georgia Adams Episode: "Poison"
2009 Drop Dead Diva Millie Carlson Episode: "Dead Model Walking"
2010 Hot in Cleveland Loretta Episode: "Meet the Parents"
2012 The Mob Doctor Ann Wilson Episode: "Turf War"
^ Staff, Variety (June 20, 2008). "Gene Persson dies at 74". Retrieved June 4, 2016. ^ "("Shirley Knight" search results)". Academy Awards Database. Academy of Motion Picture Arts and Sciences. Retrieved 2 February 2019. ^ "Shirley Knight Biography". Retrieved June 4, 2016. ^ "Shirley Knight biography and filmography - Shirley Knight movies". Retrieved June 4, 2016. ^ "An Interview With Shirley Knight". July 1, 2010. Retrieved June 4, 2016. ^ Garfield, David (1980). "Appendix: Life Members of The Actors Studio as of January 1980". A Player's Place: The Story of The Actors Studio. New York: MacMillan Publishing Co., Inc. p. 278. ISBN 0-02-542650-8. ^ a b "("Shirley Knight" search results)". Tony Awards. Retrieved 2 February 2019. ^ "Shirley Knight - Television Academy". Retrieved June 4, 2016. ^ "Shirley Knight Plays a Desperate Former Housewife in Cycling Past the Matterhorn, Opening Sept. 29 - Playbill". Retrieved June 4, 2016. ^ "ACTORS' DIALOGUE: Shirley Knight & Kaitlin Hopkins". Retrieved June 4, 2016.